This book was designed to help learners master basic Korean verbs easily and comprehensively. The 500 most important Korean verbs have been identified and presented in alphabetical order. For each vocabulary item, you can see its pronunciation, Romanization, meaning, and the �model verb� that it follows the same conjugation rules as. And then there is also verb�s table of conjugation, some familiar related words, common sentence patterns, and some sample sentence. I dare say that this is all the essential and practical information you�ll need in need in order to master each verb. 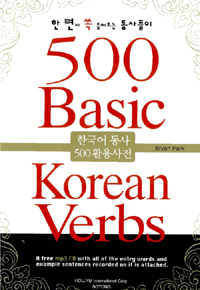 So I hope you will treat this book like a dictionary as well as a guide to studying Korean verbs.